San Diego, CA: Long time San Diego company Neyenesch Printers is proud to announce its merger with SOS Printing. The merger is completed and operations will continue under the name Neyenesch Printers at the current facility located at 2750 Kettner Blvd. in San Diego. “We are thrilled about the merger with SOS Printing and look forward to having them onboard at this exciting time. Melding two of San Diego’s long-standing printers allows for numerous growth opportunities,” said Neyenesch CEO Carol Bentley. “We are excited to be joining forces with a company such as Neyenesch Printers, they have an outstanding reputation in the community and we look forward to new possibilities,” said President of SOS Printing, Brad Reimers. 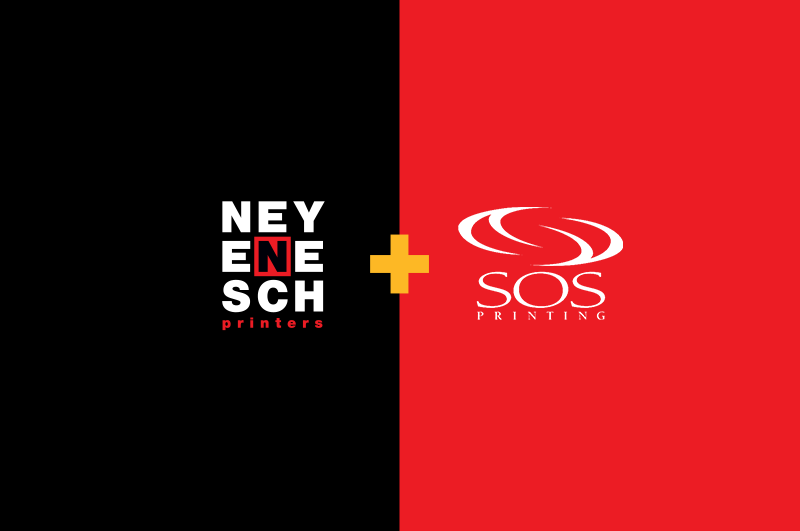 Together, Neyenesch Printers and SOS Printing form a dynamic team that will continue to honor their commitments to being more than just ink on paper and delivering remarkable quality in service and print. SOS Printing is a service focused print organization that concentrates in the digital, web and offset areas. Located in San Diego since 1967, their commitment is to bring their customers smart solutions with value propositions that utilize their many resources to better effectively market your organization. Neyenesch Printers was established in 1899 in San Diego, CA. Still family owned and operated, Neyenesch has evolved the business to provide its client’s with the most expertise, attention to detail, variety of services and environmentally conscious practices. Neyenesch Printers is certified to ISO 9001-2008, ISO 4001-EMS, FSC and WBENC, a Women’s Business Enterprise, standards.